George H. W. Bush presided over the fall of Soviet communism and led an international effort to foil Saddam Hussein’s invasion of Kuwait. But the dividends from these historic successes during his one term mostly bypassed the 41st U.S. president, who died at 94 in his Houston home on Friday, and accrued to his successors, including son George W. Bush. After a career in public service, as vice president under Ronald Reagan and stints as Central Intelligence Agency chief, China envoy, U.N. ambassador, congressman and businessman, the decorated World War Two pilot and Connecticut senator’s son was the most qualified leader to occupy the White House in the 20th century. Easily inheriting the 1988 nomination, he promised a “kinder, gentler” America, pledged not to raise taxes and portrayed his rival as soft on crime. Though Bush’s foreign policy was outwardly successful, it stored up trouble. His administration played little direct role in the fall of the Berlin Wall or the Soviet coup and counter-coup of 1991. The Russian regime of Boris Yeltsin that emerged proved ineffective and corrupt, paving the way for Vladimir Putin’s rise to power. Bush committed forces to a U.N. effort to liberate Kuwait, but ended hostilities after only four days of ground combat, leaving Saddam Hussein in power until his son went to war with Iraq in 2003. Bush worked with a Congress controlled by the opposition in ways that have eluded his successors. Defense spending declined to 4.4 percent of GDP in fiscal 1993 from 5.6 percent in the year to September 1989. Bush allowed Congress to spend this peace dividend and more, forcing him to break his “Read my lips: No new taxes” campaign pledge. The economy subsequently recessed. Bush’s handling of the downturn and inability to forge a common-man touch – immortalized by his surprise encounter with a supermarket checkout scanner – allowed Bill Clinton to win the 1992 election handily. Though Bush’s economic stewardship was imperfect, his brief tenure didn’t impede his son’s bid eight years later for the Oval Office. Wars in Afghanistan and Iraq following the Sept. 11, 2001 attacks took the country from a fiscal surplus – with origins in the elder Bush’s administration – into a yawning deficit. In that respect, Bush 41 may have been the last real fiscally conservative president. Former U.S. President George H.W. 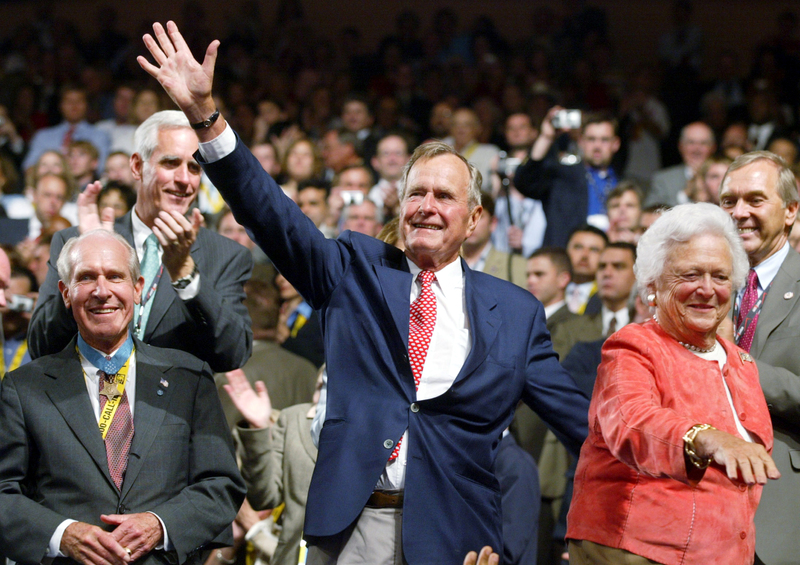 Bush waves while standing with his wife Barbara (R) and Congressional Medal of Honor recipient Thomas Hudner Jr. (L) during a tribute to veterans at the 2004 Republican National Convention at Madison Square Garden in New York, August 30, 2004. President George H.W. Bush, who was elected by a substantial majority to succeed Ronald Reagan in 1988 and lost his bid for re-election to Bill Clinton in 1992, died on Nov. 30 at 10:10 p.m. (0410 GMT Dec. 1) at his Houston home. At 94, Bush, the 41st president of the United States, lived longer than any of his predecessors and possessed one of the most impressive résumés in American political history. No further details about the circumstances of his death were immediately available. During Bush's time in office, real GDP increased by an average of 1.9 percent annually from the first quarter of 1989 to the first quarter of 1993, while inflation averaged 3.1 percent. Federal spending increased at a 5.4 percent annual rate from the fiscal year ended September 1989 to that ended September 1993. However, defense spending declined to 4.4 percent of GDP from 5.6 percent while non-defense federal spending increased at a 7.4 percent rate, rising to 17 percent of GDP from 15.6 percent, while the budget deficit increased to 3.9 percent of GDP from 2.8 percent.